I've been reading and appreciating Praful Bidwai in Frontline for a long time; just this week, I cited him several times in a post about the Nuclear Liability Bill. But I didn't realize he'd written an important book about climate change, until Nagraj Adve sent me this review, a version of which was first published in the Economic and Political Weekly, 1 May 2010. The review is well worth reading--and it sounds like the book is too. And the price is right: you can get a free copy by contacting Mr Raghavan (k.v.raghavan@hbfasia.org) of the Heinrich Boell Foundation. Global warming underlines myriad, interlinked issues, which play out at different levels. It’s a product of the logic of industrial capitalism. It will worsen by recent neoliberal development trajectories that rely hugely on the market. It’s enriched debates around equity and exposed the limits of nation-state frameworks in dealing with global ecological crises that have systemic roots. Given the absence of equity and justice therein, it’s exposed the poverty of both the development trajectory and climate policy of major governments. Its already severe impacts on ecosystems and people, in India (and beyond), and feedbacks at merely 0.8 degrees C of average warming, not merely exacerbates already existing crises faced by the poor but also highlights the dangers and possibility of runaway, dangerous levels of warming, and therein lies its urgency. The book under review deals for a good part with the hollowness of India’s climate policy, offers rich insights into notions of equity, comments on alternative climate proposals that have been discussed internationally, suggests low-carbon development strategies specifically in the Indian context, and much else. No secondary book on climate change and India can henceforth be written satisfactorily without reference to this one. A nice overview of recent scientific developments is provided in chapter 1. Not so much in the Indian context – for which Sushil Kumar Dash’s Climate Change: An Indian Perspective (CUP, 2007) is a useful but more technical read – but a more general overview, one that is refreshingly up-to-date. It has few, if any, slippages: occasionally, it uses both CO2 and CO2-equivalent interchangeably, a common error; the 350 ppm target, which many countries and NGOs pushed for before and during Copenhagen as the safe level of atmospheric CO2, and which was the focus of a major demonstration worldwide in October 2009, refers not to CO2-eq but CO2. What’s more, though accepting 350 ppm as a safe cut-off target has James Hansen’s imprimatur, and one that many of us have endorsed in the recent past, as does Bidwai, it would be fair to say it is very much a minority view among climate scientists. 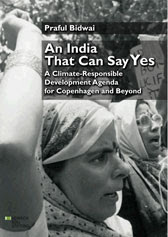 The chapters that follow subject India’s climate policy and public positions to relentless scrutiny from numerous vantage points. Bidwai analyses how the evolution of India’s climate policy has been influenced by domestic practices that recklessly promote natural resource extraction, and how it evolved within the larger frame of India’s shifting foreign policy, one that increasingly seeks a larger role in world affairs while cosying up to the world’s richer and most powerful nations particularly the United States. He points out anomalies in its strands, particularly in relation to equity. He reveals how it was arrived at completely undemocratically with little wider consultation. He demolishes the reliance on the market, both in the foregrounding of a market-led growth linked to a development trajectory that marginalizes millions and promotes deep social and regional inequality, and, more specifically, in terms of market mechanisms such as the CDM, actively being promoted in India, which do nothing but fraudulently enrich actually polluting industry. Other parts examine specific missions that are part of the National Action Plan on Climate Change (NAPCC), particularly the National Solar Mission and the National Mission for Enhanced Energy Efficiency. He points out that the proposed massive expansion of solar power assumes huge unit cost reductions in photovoltaic power generation and technological breakthroughs. A penultimate chapter argues, rightly, that the only way of promoting an inclusive society in India free of hunger and gross injustice is through low-carbon, equitable development. Additionally, the preceding chapter, in the pre-Copenhagen context, which was when this book was being written, discusses various alternative proposals that have been put forward by numerous NGOs, activists, intellectuals and other, mostly non-state actors. Finally, it speaks as much for the myriad themes that global warming touches upon as for the width of Bidwai’s scholarship that the book contains a number of boxes on varied issues: looking critically at plans for carbon capture and storage; the flaws and dangers of nuclear power in India; the threshold temperature rise of 2 degrees C and the political controversy that then arose in India; the whackiness of geoengineering solutions being proposed and tested, including iron fertilization of a large patch of the southern oceans by the Indian government; why nuclear power is not a solution; the varied positions taken by different NGOs on climate change, and yet more. The extraordinarily wide range of issues discussed within makes this book an enriching one to read, but a difficult one to review. A short review can only touch upon a couple of important themes and ideas, and runs the risk of passing over others. Two, given the relative paucity of studies of impacts, there is a need to incorporate people’s perceptions of climate change and its impacts on their lives. This latter is a vast and tricky project, and obviously cannot be the burden of one writer alone, however accomplished. Here again though, published literature is beginning to emerge, though it is possible some of it has come out after Bidwai’s book was written. See for example, Jalvayu Parivartan, SADED and Oxfam, 2009, a compilation of testimonies at a public hearing on impacts of climate change on arid zone areas. One of the key issues discussed, while critiquing India’s climate policy, is equity. India’s stand, he argues, is extremely limited in focusing merely on per capita emissions norms. A policy frame with a more rounded conception of equity would focus on ends, on equitable human development, on the right to live with dignity, and “therefore entitlements to the basic necessities of life”. Taken in the context of India’s climate stands, one couldn’t agree with him more. But here and at different points in the book he stresses the limits of emissions rights itself: “an equal right to emit GHGs can only be a means to a higher end”. The point is well taken, but on the other hand, while discussing climate change with college students and others, we have found some merit in talking about the Earth’s absorption capacity (roughly 16-17 billion tonnes of CO2 per year currently and stagnating) and the need to divide that equitably among every person on this planet, resulting in each person being entitled to about 2-2.5 tonnes per year, thereby arguing that the poor everywhere are not the cause of the problem, but are actually entitled to more, to the very basic necessities of life that Bidwai talks about. This also enables us to question nation-state frames of looking at and dealing with the problem, which is another key, linked issue Bidwai brings up. He discusses, rightly (pp. 65-68), how production itself has gotten fragmented and internationalized, how trade and exports make it difficult to accurately quantify ‘national’ emissions, how ecosystems – and impacts on them, one might add – transcend formal national boundaries, and, most of all, the key issue of equity within nations, not merely, as the Indian government is arguing, between nations. This combination of the notion of foregrounding the right to development and many notions of equity, including intra-national equity is brought together in some superb passages while concluding the discussion on alternative proposals (chapter 6). A desirable alternative conceptual approach “must give primacy to the right of development … stress historical responsibility … must include intra-national equity … set clear targets for GHG reductions and peaking … explicitly recognize the importance of preventing the overuse of natural resources” (p. 102). Given all this, I’m a bit puzzled by two things: one, the foregrounding once again, at the end of the book, of the nation-state, in discussing the impasse that preceded Copenhagen. By foregrounding this very frame, political elites have ensured not just that Copenhagen was an abysmal failure but that climate negotiations have gone nowhere in 15 successive COPs, even as the Earth hurtles towards dangerous climate change. The problem is a global one, but the nation-state is a very alluring and powerful frame, and Bidwai, like most of us, at times gets caught between the two. And two, despite a nuanced presentation of its neoliberal variant, one’s struck by the limited discussion of the centrality of capitalism and its logic, both as the cause of global warming and in limiting what might emerge as solutions to it. It is this ecologically destructive logic of capitalist growth and accumulation, to “expand without end in order to exist” that prompted Joel Kovel to write that “a remarkable yet greatly unappreciated fact (is) that the era of environmental awareness, beginning roughly in 1970, has also been the era of greatest environmental breakdown”(Koval, 2007, pp. 3, 38). It’s debatable whether lasting solutions can be implemented on the scale necessary as long as that pernicious system holds sway. Which does not take away from the relevance of proposals for low-carbon development and mitigation that Bidwai puts forward for India in chapter 7 – the need for decentralized energy generation that prioritizes basic needs of communities and local resource endowments, promotion of public transport, the System of Rice Intensification (SRI), the use of locally available material and biomass, among others. Some folks may wince a bit at his mentioning run-of-the-river projects, given the considerable damage they are already causing in some Himalayan states. And there are many suggestions for energy efficiency in different contexts, though he seems to have been much more critical of energy efficiency in some earlier writing. (In passing, I’m surprised, given how much he discusses energy options, present and future, that peak oil is not mentioned even once, an issue that is discussed in a recent book by another eminent writer. But in general, not just do most of his proposals have huge relevance for sustainability and more equitable development irrespective of climate change, they are issues that those involved in the incipient climate justice movement in this country have begun to articulate and campaign for. Or should. One is struck by how many of his positions are mirrored by stands taken by organisations, some of which were articulated in a memorandum in late November 2009 to the government of India in the context of the Copenhagen meet and endorsed by 195 organizations and a number of individuals from all over India: that the NAPCC was arrived at undemocratically and with little discussion (p. 62); that the NAPCC ignores the key issues of equity and redistribution (p. 75); the many dangers of market mechanisms such as the CDM (p. 16); that much of what the government claims as adaptation is merely a repackaging of existing programmes (p. 31); the dangerous advocacy of large dams as part of the National Water Mission (p. 85); why nuclear power is a hazardous non-solution to climate change (p. 103); the need for a more decentralized generation and use of energy, particularly in villages that have no electricity (p. 119), and that India’s growing emissions cannot be curtailed “unless India’s development model is radically restructured along egalitarian, balanced and sustainable lines which put people, not markets, at the centre” (p. 59). Praful Bidwai deals with all these and other complex themes with a lucidity, rigour and thoroughness for which he is so well known. I’d wager that no reader can come away from reading this book without being better informed or gaining deeper insights into climate change, India’s policy and development trajectory in general.